A conversation with artists Alice Creischer and Andreas Siekmann, whose practices address materializing what is concealed or difficult to represent. Sarah Lookofsky I am interested in the fact that both of your practices function to “materialize” abstract and unseen economic processes. Andreas, your practice adopts the informational graphics of the Cologne Progressives and, Alice, your work is marked by a meticulous craft aspect. I wonder if you could both talk a bit about the material qualities your work take—going beyond traditional formal concerns in order to visualize the invisible, materialize the abstract, slow down a frenetic economic pace, etc. Alice Creischer When I was invited to do an exhibition in the basement of the Secession in 2001 [The Greatest Happiness Principle Party], I was immediately inspired by the paintings of Gustav Klimt and the Jugendstil. I recognized that the ornaments functioned as a narrative structure and were a good way to narrate complex historical developments. At the same time, Jugendstil itself seemed to me like a “perverse” organic reaction to the push of industrialization, since all organic form were reproduced in a serialized way. 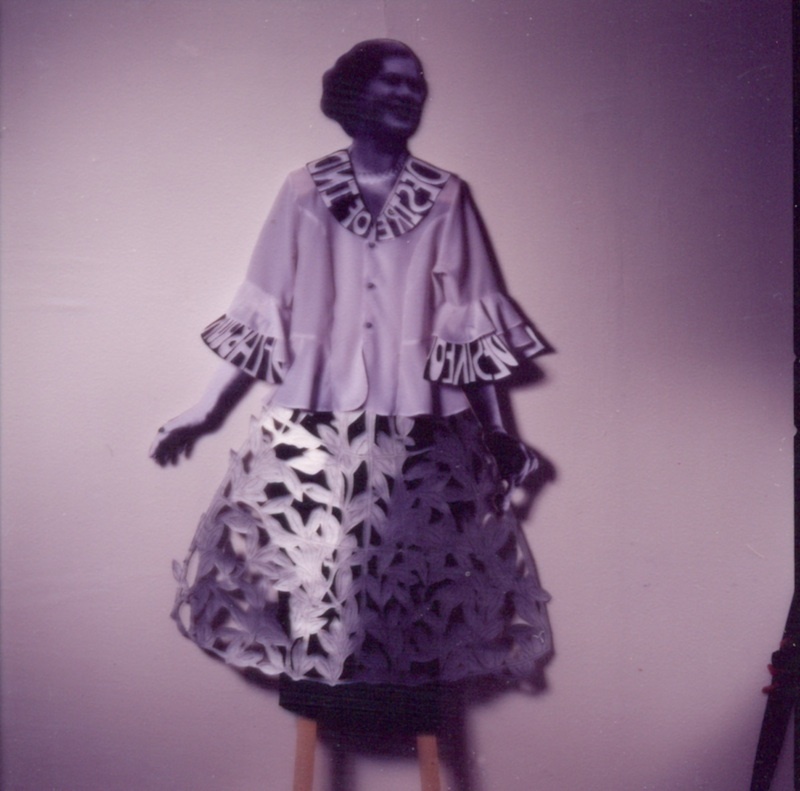 Craft is a relevant temporal/durational aspect when thinking about political history. Walter Benjamin mentioned the weaving of Penelope (she weaves during the day and destroys her weaving at night. This gives her time, protecting her from a forced marriage) as a permanent work of memory. I guess it is also a way to take the time to commit to memory. Andreas Siekmann To begin, here is a general explanation of the Arntz and Neurath method, which was for me the initial step in later developing a whole narrative vocabulary in my own works. 1929 saw Gerd Arntz and Otto Neurath commence work at the Viennese Institute for Pictorial Statistics (Wiener Institut für Bildstatistik) on their pictorial statistics atlas of society and the economy entitled Gesellschaft und Wirtschaft. Bildstatistisches Elementarwerk. The atlas comprises one hundred charts, each aimed at informing readers on the relevant economic conditions of the day. The visual manner in which this information is presented focuses on concepts of quantity. Here you can see no figures and charts professing immediate comprehension. Instead the audience is forced to halt their reading for a moment to count or rather grasp the relationship between the quantities. 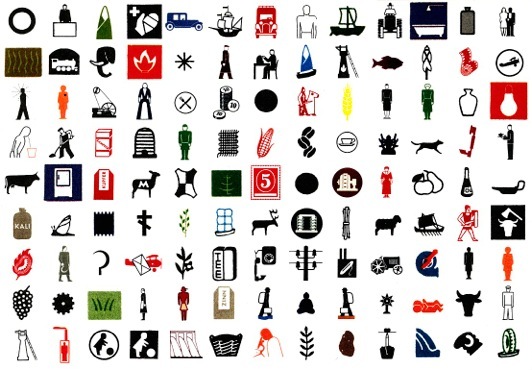 What particularly fascinated us about Gerd Arntz’ graphic work was the potential challenge thrown up by the pictorial elements to reverse the relationships they describe. At that time, this was a dedication to the soviet revolutions and their factory and barrack occupations. The atlas shows how closely the ethics of rationalization, technology and modernity were linked in the pictorial statistics project with a leftwing, revolutionary mind-set. It is today, for instance, rather hard to apply ourselves to this imagery with the urgency and topicality of those times, i.e. not to forget the real target group – the workers of the day. Conversely, we would like, by picking up this imagery again, to attempt to transfer their commitment and artistic outlook onto the present day. The method of Arntz and Neurath concerned the idea of presenting the facts of political and economic circumstances, but also to show their relations, dependencies, etc. The aim was to have the circumstances serve as arguments for a revolution. So, for me, the most important aspect of the Arntz Neurath icons is the questioning of facts as an argument for resistance. If you look at the Isostat icons, you will recognize a lot of different methods of graphic rendition relating to duration, complex subject matters, and the idea of a narration that integrates statistics and data. 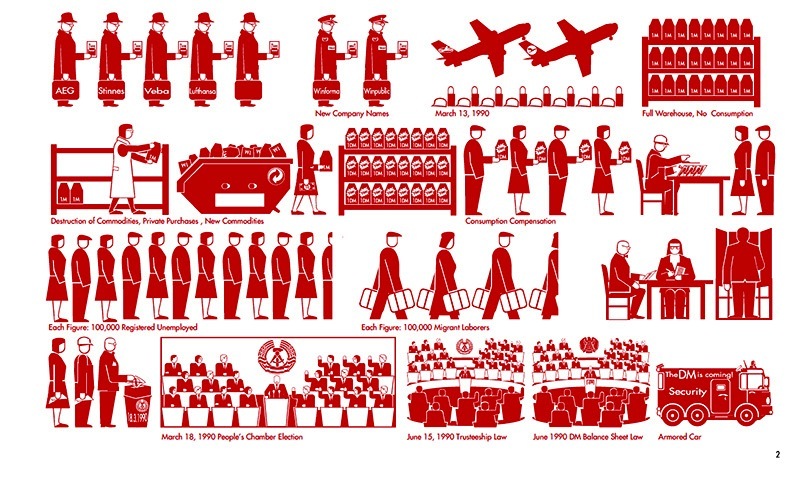 Otto Neurath’s Isotype (International System of Typographic Picture Education), developed between 1925 and 1934, to illustrate social, technological, biological and historical connections in pictorial form. SL This problem of visualization seems so important to organizing on the left today. In the US at least, several studies about inequality in the country have revealed a huge gap between the perception and the reality of inequality. In general, when people are asked to estimate inequality in the US, people tend to think the country is much, much more economically equal than it actually is. One of the things Occupy tried, and I think partially succeeded, to do (with their focus on the 99% and all its graphic renditions), was to try to make the fact of inequality more plainly understood. Would you say that your visual methods have a similar aim? 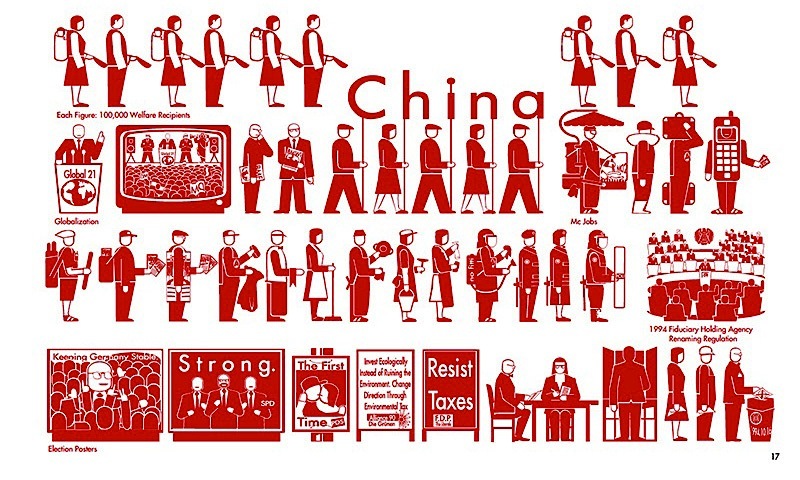 AS There is some similarity concerning the visualization of political facts that are mostly hidden by a huge ideological blindness that may have stemmed from the seemingly “happy” times of Fordism. In the case of my piece Treuhand [which deals with the privatization process of former East Germany], it was more to get a clear political argument about history–beyond the ideology/fairytales of re-unification, and the idea of “coming home to the freedom of capitalistic society.” Instead of this fairy tale, it tells the stories of privatization while showing the tools in the process. SL Both of your practices seem always to contain a pedagogical imperative. Is this an important social role for art to take in your opinion? AC When we started to do research in art in the beginning of the early 1990s, we did it because we found that political debate and engagement was missing from artistic practice at the time (we studied in the art academy in Düsseldorf in the 1980s, which was very market-focused). But our research was also founded in a general lack of political information in the daily media, which was more and more involved in the process of privatization and monopolization. We did this research in various group constellations, and this collective practice was an important possibility/space to reflect on what was going on at that time, shortly after the reunification of Germany; the end of cold war; the rise of “post-historical” global capitalism; and the new forms of exploitation and ideology that went along with it. In other words, it was more about the possibility of visualizing and thinking about what was going on politically and less about mediating already-known content to an audience. It was conceived as a way of inviting an audience to take part in a discussion about the possibilities of political research and artistic language/methods. It is very important for us to expect that art has this political and intellectual ability. AS Sometimes this kind of pedagogical approach in art seems very hierarchal, as if there is an omnipotent artist who educates the audience. For me, it is more important to share curiosity as well as knowledge about subject matter in political and economical terms and to find a means of visualizing facts, cases, contents, which challenge both sides–the artist and audience alike. SL Treuhand depicts the privatization process of the former GDR. It is a process that foreshadowed a now familiar neoliberal pattern of privatizing formerly public assets around the world. Given your careful study of this process then, how do you compare that example to later processes of privatization? AS Treuhand was surely a forerunner—or thought of as best-practice-scenario—of the privatization process that was carried out throughout Eastern Europe. In different Privatization Congresses for Eastern Europe, it was planned that the know-how gained from Treuhand-politics would become a model for transforming economies in all of Eastern Europe and the former Soviet Union. This was the translation of neoliberal policies by Thatcher and Reagan for the East. I think that especially the infiltration into public institutions of rating agencies, consultants, and investment banking was very typical for all of these transformation economies. This entailed the infiltration of the whole nomenclature of neoliberal agencies and their structured finance products into the domain of public service. The Treuhand tool was certainly also thought of as some kind of “remedy” after the crisis of 2008. In 2011, the German government wanted to send Birgit Breuel (the former president of Treuhand) to Greece as an agent of privatization. SL Another issue raised by Treuhand is the public debt burden, now such a familiar topic throughout the world and a signature effect of privatization in which private owners reap profits, while the public is strapped with any debts incurred in this process. One question for me that pertains to the question of this exhibition is how we relate these processes of neoliberalism across the world. You have done work in Latin America, western as well as Eastern Europe. How important is it to differentiate locally between these different crises? Is there a problem for you to talk in general terms about this as a universal/global phenomenon? AC Often there is a kind of theoretical hesitation to talk about global mechanisms of capital, because it has often been accompanied by the victimization of local people, their political agendas and forms of resistance. This hesitation was well-founded, but often it leads to this kind of relativism of cultural studies. I think we have to keep both in mind: the global players of industry and power as well as their local agents and local resistances. AS There a symptoms and mechanisms of so-called transformation economies, which are globally equivalent, also because the transformations and their “innovative tools” are performed by the same global agents—a process of monopolization exists, so the few rating and auditor companies, the consulting and accounting firms, and the international commercial and corporate law firms work together and accumulate more specialized information than elected governments. They create and operate an industry of societal transformations that operates between the political and economic as a consistent substitute for the common worldwide. So the granting of loans, the debt trap, and the claims of the Structural Adjustment Programs is financed by the sovereignty. Nevertheless, there are differences that depend upon how the local context reacts to these approaches: differences in the resistance to them as well as in the opportunism of elites. SL Alice, your The Greatest Happiness Principle Party choreographs a party in Vienna of the Austrian Credit Institute and addresses Western Europe’s speculation in the Balkans. This is so poignant with respect to the privatization processes that are now happening throughout the Eastern Europe. In one example, for instance, there is an office for privatization in Kosovo in Vienna, specifically targeting Western European companies for investment. Can you give a bit of background about your research into this historical precedent? AC In the 1920s and ‘30s, the Secession was very famous for their artist parties. It was the time of the great recession. I was very inspired by the photos of those parties, knowing that they coincided with the bankruptcy of the Österreichische Creditanstalt, one of the initial points of the financial recession. My main source for the research was Detlef Hartmann’s Genocide against Social Revolution. Detlef Hartmann is an important contributor to the self-organized autonomous political discussion on the left, which translates and continues the ideas of Operaism for the German context. The main idea is to reread class struggle, not so much as a struggle between the industrial worker and entrepreneur, but much more between capital and subsistence. The history of the “industrialization” of the Balkan countries–as a periphery-economy to the German “Reich”–was one example of the elimination of subsistence through a system of typical colonial financial organization: it produced an agriculture of cash crops instead of food production, which resulted in a dependency upon surviving on money. As Maria Mies, a famous feminist economist, says: “What basically opposes capital is subsistence and not wage labor. It is the concern of capital to bring everything that exists, all autonomous life […] into a commodity relationship […] For more than 200 years capital has been waging a war against subsistence. World Bank president McNamara once clearly expressed what the aim of capitalism is ‘to draw peasants away from subsistence and into commercial production.’“ Hartmann shows that the German technology of dependency within the Balkan countries was seen as a best practice example later on for Bretton Woods and the financial postwar architecture of 1st versus 3rd world. At the same time that I was working on the project, there was the G8 summit in Cologne where the invited statesmen were negotiating how to proceed with Ex-Yugoslavia. Some of the points of agreement were Democratization and Human Rights… by opening up “new markets for investment;” sources of skilled, low wage labor and trade opportunities; “economic reconstruction;” “promotion of free trade zones;” creating an appropriate “enabling environment for private sector development;” “introducing free market economic reforms and improving the climate for investment;” developing measures to break down custom barriers and other trade barriers; “improving the rule of law and legal framework regarding migration and asylum;” and so on. The typical agreement of exploitation that makes regions function as economic peripheries that produce growth in the centers, we all know. And it continues under the current austerity policies. In the German context, with its special history, I remember a late text of Pierre Bourdieu that equated the Wehrmacht with the Bundesbank. SL This is similar to what David Harvey has called “accumulation by dispossession”—which accounts both for imperialist practice of drawing on labor and resources in the developing world as well as the privatization of formerly public assets in the West. In parallel to your research on the secession parties, there is such a sharp contrast between small concentrations of unprecedented affluence and vast sectors of poverty throughout the world. In conclusion, I wonder what you think of the current possibility of resisting the current conditions of exploitation. What do you think of the effectiveness of the protest and counter-globalization movements today? AC I guess this history continues to write itself blindly. We cannot be an omnipotent historical subject capable of evaluating the effectiveness of resistance. We don’t have anything else than this abundance of local and sometimes internationally-connected local resistances. But we can see and feel what each and every resistance–that we witness personally or even hear, see or read about it—does to us: it empowers us to continue. "Disillusioned" is a section of DIS Magazine that takes on art and art-related matter that aims to disentangle and dissect how the practices of art might relate to other spheres of production. This partially involves dissolving old assumptions about the aesthetic disciplines, such as discernment, distinction, and disinterestedness, but it will also address how new modes dissolve old forms, allowing for new mechanisms of dispersal, distribution and display to emerge. But more importantly, it will examine how art is increasingly entangled with regimes of distraction, disingenuous affirmation and disposable culture. Disabused will therefore also be a place where arts professionals can express their discomfort and discouragement, even their disgruntlement and disgust; temporarily dissociate from or disown their sites of production; or enact dissent, dissidence, disruption and disobedience. We will do our best to make sure this is all done with the utmost discretion, of course.